Obama could win the swing state, thanks to the thousands of early voters that withstood long lines, GOP pressure and poor weather to cast their ballot this weekend. 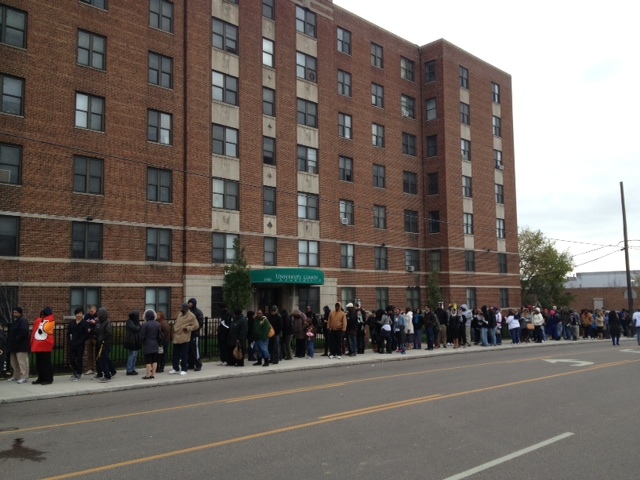 It probably didn’t feel this way for those waiting in line, but voters in Ohio were lucky to have this opportunity. The Ohio GOP legislature and Secretary of State Jon Husted banned early voting three days before the election, only to be overturned in court as a result of a lawsuit filed by the Obama campaign. In Cleveland’s Cuyahoga County—where Obama needs a big turnout to win the state—5,661 people voted early this weekend, compared to 6,457 in 2008. Turnout in Cuyahoga had surpassed 2008 levels until Hurricane Sandy hit and left many parts of the city without power. Still, the Obama campaign feels good about its chances in Ohio based on the early voting turnout, noting that 537,000 in-person early votes have been cast in 2012, compared to 460,000 in 2008. As of Monday, Ohioans in counties Obama carried in 2008 have already cast 903,645 ballots, either through in-person early voting or absentee voting, compared with 482,384 votes cast from counties McCain carried. According to the latest NBC poll, “In Ohio, 35 percent say they have already voted or plan to do so, and Obama is leading them, 62 percent to 36 percent. Yet Romney is up among Election Day voters in the Buckeye State, 52 percent to 42 percent." On Sunday morning, Pastor Larry Harris rallied his congregation in a “Souls to the Polls” service at Mount Zion Baptist Church, the oldest church in the Mount Pleasant area. “This is the last hurrah, the last hee-haw, to make sure we get out the vote,” Harris said. Following the service, twenty-eight people got on buses and went down to the board of elections to cast their ballots—an act multiplied across the Ohio area. The effort by Ohio Republicans to limit voting rights in the state has made traditionally disenfranchised communities even more determined to exercise that right. “When they went after big mama’s voting rights, they made all of us mad,” said Reverend Tony Minor, Ohio coordinator of the African American Ministers Leadership Council. African-Americans comprise 28 percent of the population in Cuyahoga but made up 56 percent of early voters in 2008. 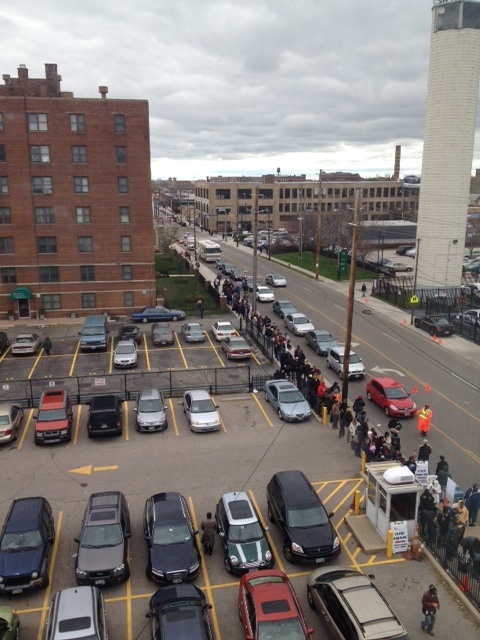 Judging by the lines I saw in Cleveland, that number could be even higher in 2012. The lines were long this weekend, but, unlike in Florida, things went relatively smoothly at the polls. But the real test will be on Election Day. Already, the Tea Party group True the Vote has requested that their “poll watchers” be let inside polling places in heavily African-American voting precincts in Columbus in order to challenge voters they believe are ineligible to cast a ballot. The Lawyers’ Committee for Civil Rights has set up forty-six dedicated phone lines to handle Ohio-related voting complaints through its 1-866-Our-Vote hotline. In 2004, an estimated 174,000 Ohioans, roughly 3 percent of the state’s electorate, left the polls without voting because of long lines. Hopefully, as a result of early voting, that won’t happen again. For more on the fight to preserve voting rights, check out Brentin Mock’s dispatch from Florida.